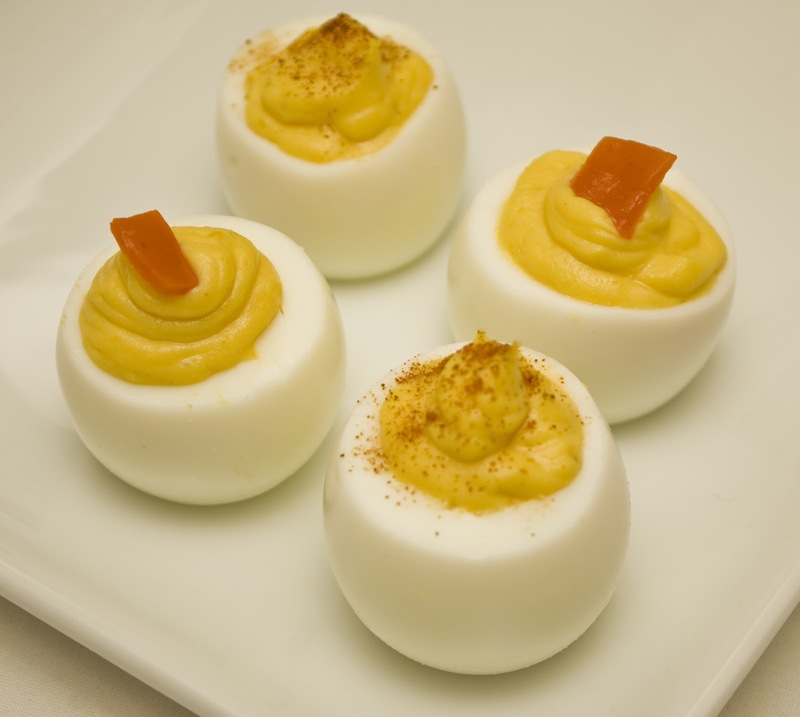 Thanksgiving is only a few days away, and one of my favorite appetizers to make are classic deviled eggs. Everyone seems to love these. Usually half of them will be gone before I can even bring them out of the kitchen. This time around, I decided to make a full egg instead of splitting them down the middle, and creating two half deviled eggs from one egg. I like the whole egg option, as it is much easier to display on a plate. You just cut the bottom flat and stand them up. It's much easier than having the half eggs wobbling around on a plate or platter. Even though I have a deviled egg platter, which is just a platter with smooth divots to hold the half eggs in place, I still prefer the whole egg option. Plus, it gives each person a little more egg to eat. The first thing you need to do is boil the eggs. Try not to use fresh eggs. I don't mean they have to be spoiled or anything, they should just be eggs that have been in the refrigerator for at least 3 to 5 days. If you use fresh eggs that you just bought, they will be harder to peel. Eggs that have been around for a few days are easier to peel. You can always test if an egg has gone bad by placing it in a bowl of water. If it floats, throw it out (preferably in your food compost bin). If the egg lays on its side at the bottom of the bowl, it's good to use. If the egg stands up at the bottom of the bowl, but does not reach the top of the water, it is still good to use. As an egg ages, the air pocket inside the egg grows. The more air inside the egg, the better chance of it spoiling. Be sure to bring your eggs to room temperature before boiling them. This will minimize them from cracking when boiled. After taking the eggs out of the fridge, let them sit for 20 to 30 minutes. If you don't have time to just set out your eggs until they have reached room temperature, you can run hot tap water over the eggs to slowly warm them up. You can knock one minute off the the boil time if you start with eggs at room temperature, rather than eggs straight out of the fridge. Choose a large enough pot so that the eggs are not stacked on top of one another. A single layer at the bottom of the pot is best. Don't fill the pot with too much water, otherwise it will take longer for the water to boil. Fill the pot to about one inch above the eggs. Do not add salt to the water, The salt will raise the boiling point of the water making the egg whites rubbery. Turn the burner on high. As soon as the water reaches a rapid boil, remove the pot from the heat and cover the pot with a lid. Let the eggs sit in the covered pot for 17 to 20 minutes. After the eggs have sat for 17 to 20 minutes, remove the lid and drain the water from the pot. Once the water is drained, place the eggs in a bowl of ice water for about 10 minutes. The cold water will cause a layer of steam to develop between the shell and the egg white. This will make peeling the eggs much easier. To peel the eggs, I crack them under running water in the sink. I use the back of a spoon to tap around the egg to crack the shell. Start peeling at the larger end of the egg, as that is where the air pocket is located. Start peeling back the egg membrane under the running water, and the egg shell should easily peel off. For me, this recipe is based on taste. That is why I don't have set measurements. I mix all of the ingredients in a large bowl, and whisk until smooth. I then taste the filling and add extra mustard, mayonnaise, or pickle juice until it tastes just right. Next I place the egg yolk filling into a plastic sandwich bag or freezer bag. I then cut one of the bottom corners of the bag and create my own pastry bag. This makes it much easier to squeeze the yolk mixture into the egg white cup. I fill each egg white cup with the mixture. You can fill them a little, or a lot. It's up to you. 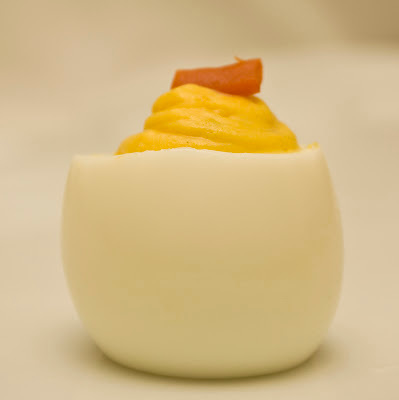 Lastly, you can garnish the deviled egg with anything you like. 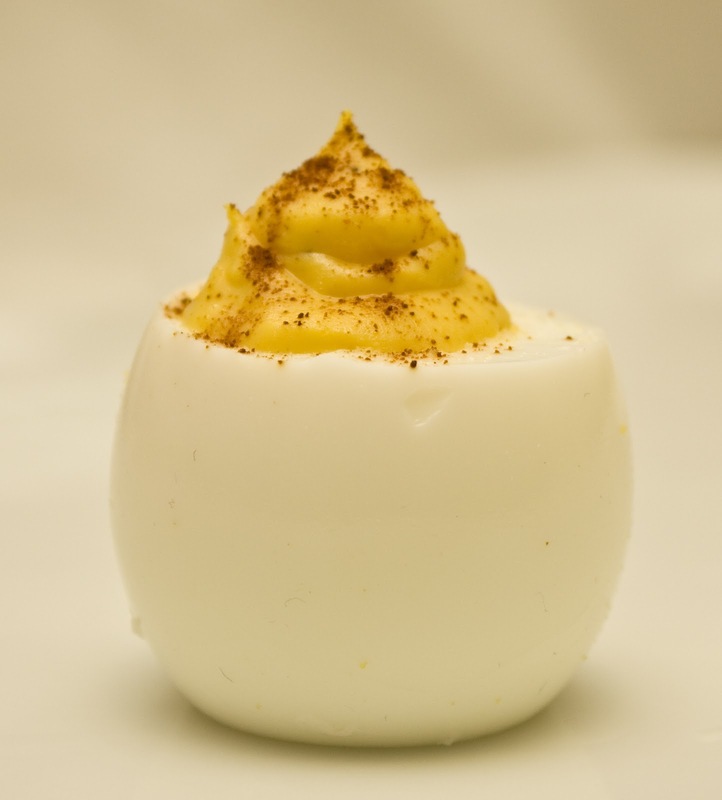 The classic deviled egg is topped with a sprinkling of Paprika. I also top them with an olive pimento. You can also use capers, salmon, roasted garlic, sun dried tomatoes, feta cheese, green onions, Chorizo, shrimp, or anything that sounds good. 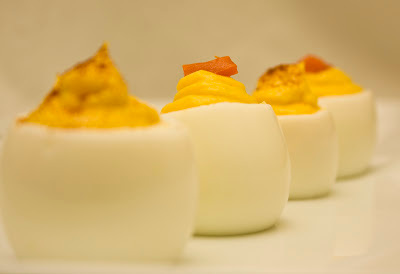 You can also create a deviled egg topping bar where your guests can top the eggs with whatever topping they like. I hope this recipe and tips are useful in making deviled eggs as an appetizer for your Thanksgiving dinner or any dinner you may have!